It has taken me a while to notice them and their subtle differences, but now that I have, they are all I see everywhere I go. My eyes just can't help it. I'll see one coming toward me in the mall and I will steal a glance - careful not to appear like I am staring. That would be highly inappropriate. I have become quite serious about recognizing the different styles. A secret pastime while out and about. Laugh if you want - you would do it too if you were here. Especially in the heat of the summer when everyone you know is gone already and it is too hot for the pool, the beach, or any public park. You need to make your own fun in these parts. No judgements please. What am I yammering on about this time? Not the latest sunglass fashions or hair styles... not bird watching or spotting a new Porsche Cayenne in a parking lot. No, I am stealing glances at ghutras. What men wear on their heads here. For real. Not a joke. Let me back up a bit and give you the basics. 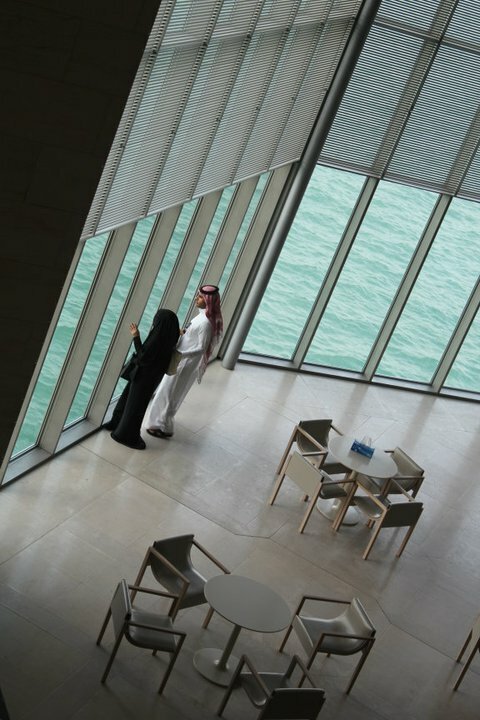 Qatari national dress for men (much like other GCC countries) includes wearing a thobe, which is basically a long white shirt that goes to the ankles, over loose white pants/shorts. 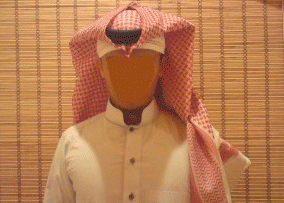 They also wear a loose fabric headdress, called a ghutra, in white or red-and-white patterned cloth, held on with a black rope or chord with tassles, known as an agal. 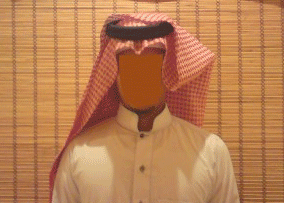 Qatari national dress for women consists basically of covering their heads with a black headdress called a shayla, and their bodies with a long black dress called an abayha. 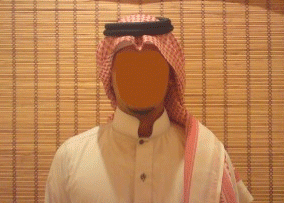 Some women also cover their faces with a black bourga; sometimes the eyes are left uncovered; it really varies. English spelling of these clothing names can differ, depending on translation. All this black and white drifting through the malls and restaurants is quite eye catching to a foreigner. I never grow tired of noticing the subtle differences in appearances... for both men and women, the accessories are everything. Cuff links, sunglasses, stylish pens, handbags, and shoes. Shiny and expensive. Small bits of bling everywhere. 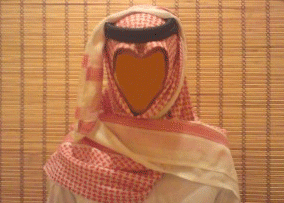 I noticed right away that the ghutra is to young Qatari men what long flowing locks of hair are to any teenage girl. They toss the long bits over their shoulders, fussing with them constantly, they stop in store front windows to view their reflections and fix their ghutra and agals 'just so'. It is a great source of pride, indeed. A simple and popular look with the older fellas. 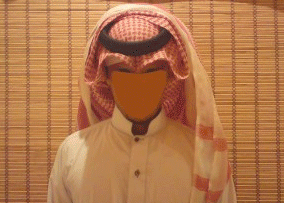 Just throw one end of the ghutra over the opposite shoulder and you are ready to rock and roll. Looks like it would be good to protect your face on a sandy day too - always handy. This is similar to the Modesty Style, only this time you take the other end of the cloth and flip it over the opposite shoulder. I haven't seen this one around yet but I have allll summer, don't I? You can see from the picture why it is called 'Mr. X'. 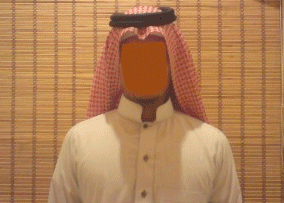 Just toss both ends of the ghutra over opposite shoulders. Apparently from what I have read, this is good for desert trips and cold winter months. Its important to stay bundled up with it drops down to 22C in January. Brrr. 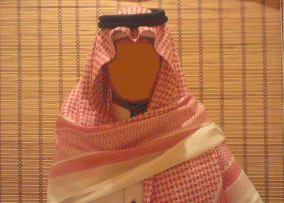 This is the one you will often see worn by government officials and ministers, and at formal events like weddings. Just let your ghutra hang low, maybe adding some funky little folds on both sides of the mirzam (which is the area of the ghutra in the middle of the forehead). This one is quick and easy and seen everywhere in Doha. Again, let the ghutra hang down, only this time tuck the ends behind your back. It's a cinch to create and great if you are moving around constantly, hence the name "The Teacher". This one is popular at the universities around town - modern with a traditional touch. 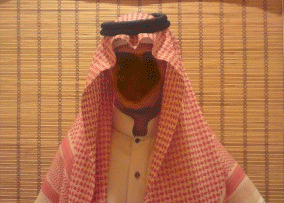 You bring one end of the ghutra from behind and put it in front of the opposite shoulder, while the other end remains down the back. This one is a personal fave. This one is named after Mr. Khaled Abu Rashed, who happened to be the lawyer of the infamous drifter Abu Kab. He allegedly mastered this style. All you have to do is throw one end of the ghutra above your head while leaving the other hang down. Colin and I call this bad boy the "Gretzky"... true hockey fans will know why. Given it's name, you can see that this one looks like a balanced scale from the front. You toss both ends above the head with a slight angle on each, while leaving space to form what resembles scale pans. This one might be tricky to keep if it is windy outside. This screams high maintenance to me! This one was a huge hit in the 90's, and got its name from its resemblance to the venomous snake. You need a large amount of starch and a hot iron to stabilize this puppy, and one needs to practice caution when moving their head too fast to keep this delicate piece intact. This is still very popular around Qatar. Unlike the stiffness of the Cobra, which limits the ability to move freely for fear of collapsing the design, this one allows freer movement. Easy to create and wear, it's great in the summer time and very popular this year. Think flower child of the desert. There wasn't any details on the history of this one online, and I haven't spotted one of these around town yet either. A very rare bird, perhaps? Looks complicated and a bit delicate, but impressive nonetheless. I'll keep on the lookout. So there you have it. Who needs to bird watch, coin collect or scrap book. Just head to your local mall or supermarket when its 125 degrees outside and watch the Ghutra styles bob on by in all their Arabic glory. That is truly fascinating! Thanks for the education.....and the laugh!! LeanneD. 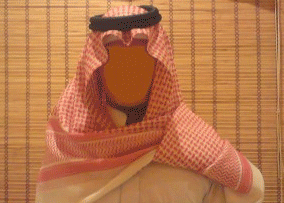 oOooOOOoooooOOoo.....The inner prep in me like the Schoolboy, but the Abu Rashed - it's jaunty. damn. "likes". grrr...note to self, "remember to proof comments before posting". Now I'll be staring, too! Thanks for the detailed info. Very interesting. Awesome Tash! Love the shout out to The Great One! Love your blogs, I truly believe you should be a columnist. You have a talent! Plus I live a sheltered life and all this culture is an eye opener for me. Keep em coming see you soon! The scales look impossible to manage. How the hell do they walk around without messing it? Must have lots of sore necks! Absolutely love it. I just laughed out loud! Thank you. Wow - who knew?! I do now! 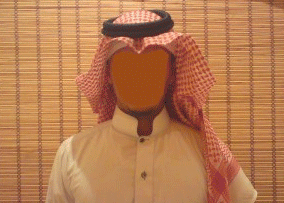 You can tell so much about a man just by his Ghutra, eh?! It is good to be back at last catching up with your blogging activities, this was so interesting i had no idea. I prefer to blend and therefore would be partial to "The Teacher"....however should I find myself faced with a tough negotiation I might don "The Cobra" for intimidation factor. Me like school techer. U should writ in arabic! 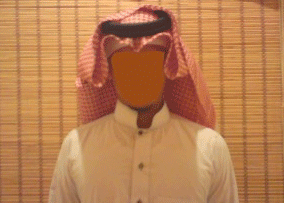 Were can I buy a original saudi ghutra or Keffiyeh/shemagh online? wow. ten years in Qatar, I have never noticed that there are styles to the ghutra. thanks for the educatively hilarious post!